Affordable housing and gentrification are two very important issues in District One and I've done more than just talk about them. I have worked consistently to address these issues in the neighborhoods most affected. I am delighted to have the endorsement of a group of native and long-time residents of the Historic Cherry neighborhood - neighbors who have witnessed first hand my work in bringing more affordable housing to the community. I have worked tirelessly over the years alongside Dr. Sylvia Bittle-Patton and other Cherry advocates to protect the homes of long-time residents. I was honored in 2015 to receive the Champion of Cherry award and am honored today to receive the endorsement of these advocates for Historic Cherry. 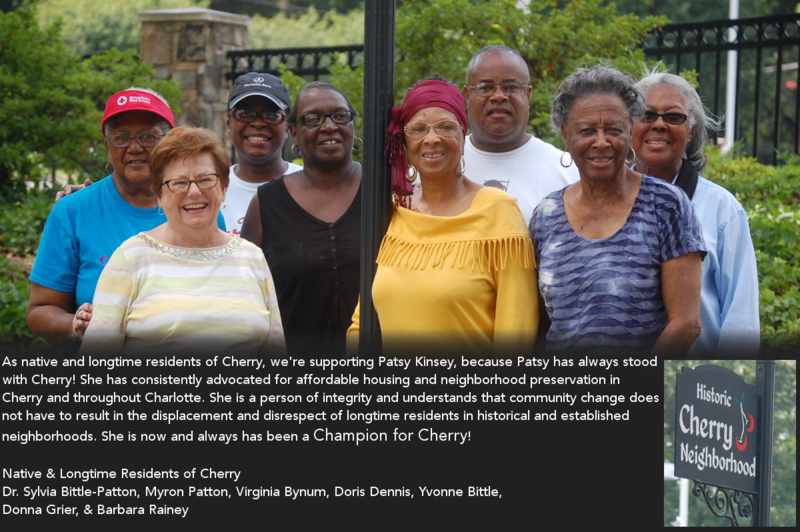 As native and longtime residents of Cherry, we're supporting Patsy Kinsey, because Patsy has always stood with Cherry! She has consistently advocated for affordable housing and neighborhood preservation in Cherry and throughout Charlotte. In 2014, when promises made to our community regarding affordable housing were broken and no other Council Member (Democrat or Republican) would stand up for Cherry, Patsy stood alone! She is a person of integrity and understands that community change does not have to result in the displacement and disrespect of longtime residents in historical and established neighborhoods. She is now and always has been a Champion for Cherry!